Tumor lysis syndrome refers to the laboratory and clinical results of rapid breakdown of high volumes of malignant cells. Significant electrolyte disturbances, particularly hyperkalemia, hypocalcemia, and hyperphosphatemia, in tandem with severe hyperuricemia, are disease hallmarks. The most significant clinical sequelae of these disturbances include life-threatening cardiac arrhythmias, sudden death, seizures, and renal failure due to precipitation of uric acid or calcium phosphate in the renal tubules. With the advent of more potent targeted and biological therapies, tumor lysis syndrome is being encountered in diverse oncology patient settings, with increasing incidence, and in diseases previously not considered high risk. Failure to identify and apply preventative strategies to at-risk patients may result in life-threatening complications and premature death. Once established, tumor lysis syndrome is a medical emergency that requires acute intervention but is inherently reversible with appropriate supportive measures. In the palliative care setting, cancer patients remain at risk of tumor lysis syndrome, and clinicians should be aware of its potential at all times, particularly as its onset may be iatrogenic. Clear communication between clinicians and patients is critical in order to ensure that appropriate interventions are delivered in a timely fashion while considering a patient’s wishes delimiting ceilings of care. This chapter provides an overview of the etiology, symptomatology, and standardized definitions of tumor lysis syndrome. 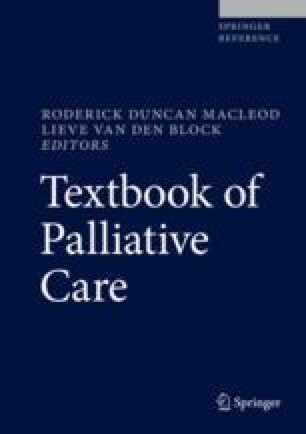 We also discuss prevention, management, and special considerations in the palliative care setting.